Posted by Carthik in applications, Friends Etc., snippets. Via Chris Ilias’ Blog comes this gem of a tip. If you use Mozilla Thunderbird, and love the threaded view, but hate losing the threaded view whenever you click on “Sender” or “Date” to sort the messages, then this is the tip for you. This helps you keep the threaded view regardless of how you sort the messages. Go to Tools–>Options–>Advanced–>General, and select the Config Editor option. I find the threaded view useful when browsing the list of bug-related emails, for one. 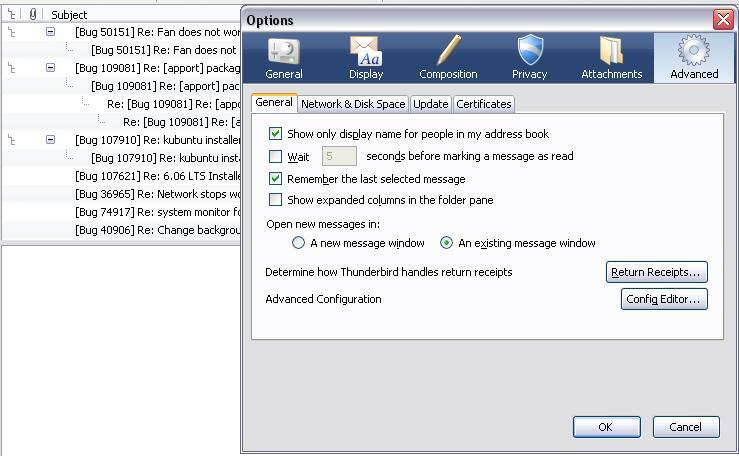 Of course, I use the Claws GTK email client much more than I do Thunderbird, but I have Thunderbird setup on an infrequently used office computer, and I thought many of you might be using Thunderbird anyways. Yes, the screenshot was taken in Windows since I use Thunderbird only on one machine at work. It should work the same on Ubuntu, though. On Linux should it not be Edit -> Preferences -> Advanced … ? I am trendy here and consideration it would be good to inject myself. I am a waitress, basically. Has nothing much to do with this here. But anticipation notable might want to know. Maybe this brief is soemwhat stupid. I ordain look how others do it and then improve. Until then, humour counter and proclaim me what I can improve. I am trendy here and consideration it would be good to inject myself. I am a waitress, basically. Has nothing much to do with this here. But touch luminary force want to know. Maybe this brief is soemwhat stupid. I will look how others do it and then improve. Until then, desire respond and proclaim me what I can improve. en güzel ve çılgın kızların sikiş videoları reklamsız yayın anlaşıyla deliyarakda. Hello e-friends i am a new member and i would like to present to you my new web site where you can watch dbz online for free. eskişehir şehrine özel emlak sitesi eskişehir kiralık daire ilanları ara. Generally I don’t understand article upon information sites, nonetheless want to express that this kind of write-up quite obligated me to take a look at and do so! A person’s composing preference has been stunned myself. Thank you, great write-up.